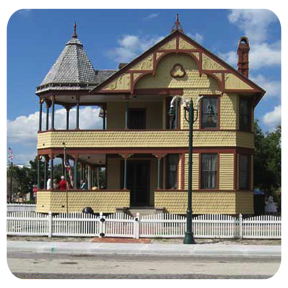 Did you know that the City of Titusville has a local Historic Preservation Program? According to a Historic Structures Survey conducted by the City, many properties are eligible for a National or Local designation. Many other Cities have successfully designated Historic sites that have resulted in higher property values and special places that are gems of their communities. The City of Titusville is working to do the same. We hope you will be interested in attending our annual workshop in October and hear about about the City's voluntary designation program. CLICK to enlarge, print & share this announceent. City Hall • 2nd Floor • 555 S Washington Ave. The Historic Preservation Board will hold an informational workshop featuring Architect Stephanie Ferrell who will describe the project to rehabilitate the Walker Hotel (Café Chocolate) and the former Bank of Titusville building. Historic Preservation Specialist Ruth Akright will be speaking about rehabilitation versus restoration. There will be a presentation on the City's New property to abatement program. Homes that are currently on the City's local register of historic places. Click on the House name to go to a detailed webpage with photo(s). Click on the House name to see the detailed request with photo(s). Promote the health, safety, education, and cultural and economic welfare of the public by preserving and protecting properties of historic, cultural, archaeological, aesthetic and architectural merit. Strengthen the economy of the City by stabilizing and improving property values in historic areas. Assist the City and property owners to be eligible for federal tax incentives, federal and state grant funds, and other potential property tax abatement programs for the purpose of furthering historic preservation activities. Foster civic pride in the accomplishments of the past; protect and enhance the City's attraction to visitors; and promote the use of individual sites and districts for the education, pleasure, and welfare of the people of the City. Prepare, update, and maintain a plan of protection for historic sites and districts. Provide recommendations to the City Council regarding the designation of historic districts, sites and resources. Review all exterior changes to existing sites and structures, and new developments within designated districts. 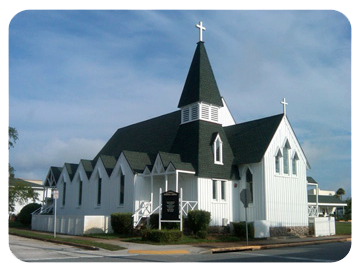 WHAT RESOURCES CAN BE DESIGNATED AS LOCAL HISTORIC LANDMARKS? 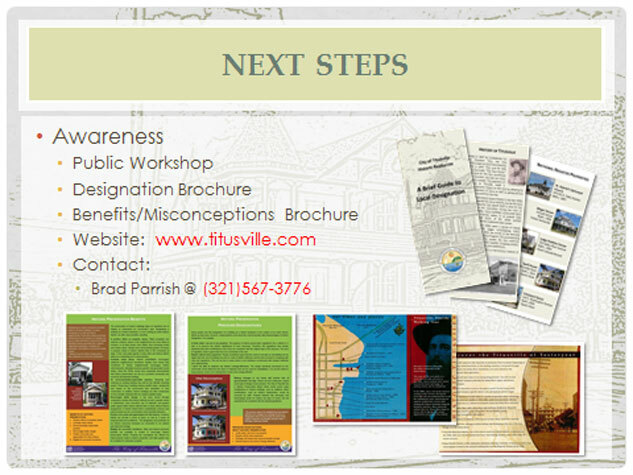 Are significant in Titusville's history, architecture, archaeology or culture. Possess integrity of location, design, setting, materials, workmanship or association. Associated with events that have made significant contributions to our history. Associated with the lives of persons significant in our past. Embodies the characteristics of a distinctive architecture style, construction style, or period; or was built by a prominent designer/builder. Yields, or is likely to yield, historical or pre-historical information. Designated on the National Register of Historic Places. Related or part of a landscape, park, environmental or other distinctive feature tied to a historical, cultural, or architectural motif; or is an easily identifiable visual feature and contributes to the distinctive quality of such neighborhood or the city. The property owner petitions the Historic Preservation Board (HPB) for designation of the property as an individual resource, site or archaeological site or zone. The HPB either accepts or denies the application. If accepted, the HPB sets a date for a public hearing and directs staff to complete the Designation Report. City staff prepares the Designation Report and recommends approval or denial based on the designation criteria. A copy of the Designation Report and a notice of the public hearing are mailed to all property owners. A notice of public hearing is also published in the newspaper. At the public hearing, the HPB makes a recommendation to the City Council to approve, deny or amend the proposed designation. The City Council approves, denies or approves with conditions the designation. If approved, the property gets listed on the City of Titusville's Historic Register.